CanRAC is the Canadian Residency Accreditation Consortium, comprised of the Collège des Médecins du Québec (CMQ), the College of Family Physicians of Canada (CFPC), and the Royal College of Physicians and Surgeons of Canada (Royal College). In collaboration with other residency accreditation stakeholders, CanRAC partners have led and facilitated the development of CanERA. Why are we changing accreditation? CanRAC began embarking on the reform of the accreditation system in 2013 in response to feedback from residency accreditation stakeholders, in light of changes which were underway in medical education (e.g., competency based medical education), and in keeping with the three colleges’ commitment to broader discussions as part of the Future of Medical Education in Canada Postgraduate Project (FMEC-PG) to identify opportunities for alignment, streamlining and better coordination of accreditation processes across the continuum of medical education. CanRAC explored opportunities and new directions for the conjoint system of residency accreditation, which resulted in the development of CanERA, which maintains the strengths of the previous system of accreditation, while addressing identified challenges and reflecting changes in residency education. What is staying the same in the accreditation system? While there are new features being introduced with CanERA, CanERA aims to preserve the strengths of the current system, including but not limited to general and discipline-specific standards that are applicable Canada-wide, maintaining an onsite aspect within the accreditation review process, the conduct of accreditation reviews by peer reviewers, resident input into the accreditation process, and the integration of input from specialists in the discipline. What is changing in the accreditation system? Note: There are aspects of the accreditation process that may change specific to an individual’s role in the accreditation process that are not listed here. These will be communicated as part of training, tools, and support provided to assist with the transition to CanERA. Learn more about training, tools, and support for the transition to CanERA. When can I expect changes? The implementation of CanERA includes a phased approach of prototype testing prior to full implementation, which is planned for July 1, 2019. It is important to note that prior to July 1, 2019, the new system of accreditation, CanERA, will be applicable only to the regular accreditation reviews of the two Prototype 3 Universities (i.e., Dalhousie University and McGill University). Prior to July 1, 2019, CanERA will not be applicable to any other accreditation reviews (i.e., mandated internal reviews, external reviews, progress reports) or applications. As of July 1, 2019, CanERA will be applicable to all universities and their residency programs. For additional details, please visit Timeline for Accreditation Reform. The development of CanERA has been a collaborative process from its onset to ensure the development of an accreditation system focused on markers of quality residency education, while also taking into consideration the need to improve clarity of expectations and efficiency of processes to decrease any unnecessary burden on residency programs and postgraduate offices. Collaborative efforts began with the partnering of the three colleges as CanRAC and quickly evolved to include a number of working groups and committees: the Standards Development Integration Committee, six standards development working groups, the Accreditation Process Advisory Committee, the Conjoint Taskforce on Resident Input into the Accreditation Process, and the conjoint translation working group. Membership on the various working groups and committees includes representation from residents, resident organizations, postgraduate deans, postgraduate managers, program directors, faculty, program administrators, the Federation of Medical Regulatory Authorities of Canada (FMRAC), CFPC, CMQ, and the Royal College. In addition, between November 2016 and February 2017, national consultations were conducted to solicit stakeholder feedback on the draft standards and process components of CanERA via online survey. A total of 231 respondents completed the survey, from more than 1400 invited stakeholders, including residents, postgraduate deans, program directors, the residency accreditation committees, and specialty committee chairs. The feedback collected was reviewed by CanRAC and the various applicable working groups and informed subsequent development of CanERA. CanRAC has also hosted Accreditation Summits over the past few years, with individuals invited including leadership, staff, and accreditation committee members of the three colleges, as well as postgraduate deans (or their respective PGME office delegate), members of APAC and the Standards Development Integration Committee, and staff and resident representatives from the Resident Doctors of Canada (RDOC) and the Fédération des médecins residents du Québec (FMRQ). Feedback provided during these summits has indicated high levels of support and understanding of the new accreditation system as well as the need for training, tools and support to facilitate transition to CanERA. Moving forward CanRAC will continue working with key stakeholders, providing regular updates and soliciting feedback as well as general and individualized training and support. How have the General Standards of Accreditation changed? A key feature of CanERA is the new General Standards of Accreditation for Institutions with Residency Programs and new General Standards of Accreditation for Residency Programs. In comparison to the current general standards, the new general standards increase focus on outcomes (“show me that it works”), allowing for flexibility; increase clarity of expectations; renew emphasis on the learning environment and continuous improvement; and accommodate both time- and competency- based education models. The new standards are also written in alignment with a new standards organization framework. However, despite the changes, it is important to note that a residency program/institution is still a residency program/institution, and as such, while expectations have evolved in alignment with the improvements noted above, the core expectations of a residency program/institution remain the same (e.g. an appropriate education program, system of assessment, an appropriate structure to oversee residency education etc.). With respect to Family Medicine programs, new Standards of Accreditation for Programs in Family Medicine have been developed. The new standards incorporate the new General Standards of Accreditation for Residency Programs, in addition to discipline-specific expectations; this document will effectively replace the current “Red Book”. With respect to Royal College disciplines, in preparation for Prototype 3 and full implementation, the Royal College, in consultation with each specialty committee, has transferred the content from the standards of accreditation for each discipline in the pre-CanERA template, to a new template aligned with the new General Standards of Accreditation for Residency Programs. This process was not intended to serve as mechanism to make changes to existing discipline-specific expectations; as such, for the majority of Royal College disciplines, while the format of the discipline-specific expectations may look different, the expectations remain the same. The exceptions to this are if your discipline (i.e. specialty committee) made changes to your discipline-specific expectations independent of CanERA (e.g. in alignment with the transition to competency by design (CBD)). What are two-year follow-ups? Are there specific expectations of the postgraduate offices and/or residency programs every two years? The new accreditation cycle includes a robust external review process for those institutions and residency programs requiring follow-up between regular accreditation reviews, with external reviews scheduled according to predictable, two-year intervals. External reviews (for a given institution) are bundled into a single two-year visit, which is conducted by a team of surveyors (in proportion to the number of reviews). Any residency program/institution required to submit an action plan outcomes report (based on an accreditation decision of Accredited Program/Institution with follow-up by action plan outcomes report (APOR)), is also expected to submit their APOR at this two year mark. Of particular note; however, is that should a residency program/institution not have any follow-up mandated at one or both of the two-year marks by the college(s) (i.e. the residency program/institution received an accreditation decision of Accredited Program/Institution with follow-up by regular accreditation review), this does not mean that residency programs/institutions need not undertake improvement efforts. 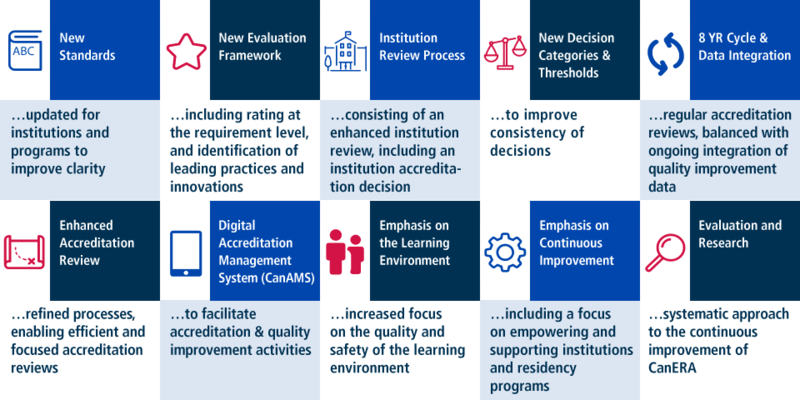 In addition to the expectation that residency programs/institutions are working to address any areas identified for improvement, the new accreditation standards include general continuous quality improvement (CQI) expectations and residency programs should be taking full advantage of the digital accreditation management system (CanAMS) throughout the cycle to assist with CQI efforts and reduce the burden of work often associated with preparation for accreditation reviews. In addition, while specific follow-up at these two year intervals may not be required by the college(s), a postgraduate office may mandate specific follow-up (e.g., submission of an APOR) for each of its residency programs; however, this is at the discretion of the institution. What is data integration and how will it be implemented? Data integration refers to the introduction of new sources of information regarding institution and program quality that will be generated on an ongoing basis, not necessarily in the context of a specific accreditation review. The introduction of data sources is proposed to occur in stages that will require consultation, testing, and evaluation before the data/information would be considered for full implementation (i.e. be included as a source of data/information to inform accreditation reviews). As such, data integration will be implemented iteratively over the course of the next accreditation cycle(s). To start, data integration will be minimal, consisting of an initial deployment of an annual survey of residents and faculty administered by CanRAC, with the data available to the institution and residency programs in alignment with principles for sharing of such data developed by the Task Force on Resident Input into the Accreditation System. The principles for sharing of this data aim to balance the need for data/information to inform the continuous improvement and quality assurance of residency education, while protecting confidentiality of participants. Of note however, as the surveys are currently in the proof of concept/validity testing phase of the data integration model, at this time, results of these surveys will only be made available to the postgraduate office and residency programs for continuous improvement purposes. Once the surveys have been validated, they will be integrated into the accreditation review process; Institutions, residency programs, and those completing the surveys will be notified when this happens. When will the College(s) intervene based on data integration? Once a data integration source (e.g. the resident and faculty surveys) have been validated, first-time concerns identified through data integration sources will be managed by residency programs as part of the continuous quality improvement (CQI) process, with the postgraduate office receiving a general notification to maintain oversight. Repeat identification of the same concern(s) will require the postgraduate office to become involved in the CQI process, with the expectation that the residency program complete an action plan outcomes report (APOR) for submission to and review by the postgraduate office. If issues remain ongoing following two notification instances, the postgraduate dean will be required to write a response to the appropriate residency accreditation committee. Following receipt of the letter, the residency accreditation committee will review the response and determine what, if any, additional follow-up is required (e.g., APOR, External Review). Who will own the data associated with residency accreditation data integration? With respect to ownership of the data, postgraduate users will own the data collected. Furthermore, the data will be collected anonymously and will be de-identified when accessed by the colleges and specific programs; that is, CanRAC users will not be able to review any individual’s identified data. What are the benefits of a digital accreditation management system (“CanAMS”)? The development and implementation of CanAMS has been identified as a key enabler of residency accreditation reform. The implementation of CanAMS to support residency accreditation activities is intended to streamline and improve the residency accreditation process. Speaking specifically to postgraduate offices and their residency programs, CanAMS will provide the tools necessary to shift current efforts associated with accreditation to higher value activities, more beneficial to residency education. Most notably, CanAMS will transform the current process of preparation for accreditation-related activities (e.g. the labour intensive process of populating the pre-survey questionnaire) to a process of reviewing the CanAMS institution and residency program profiles to validate that information is up to date. CanAMS will also support the continuous improvement activities of the postgraduate office and its residency programs, providing tools and new sources of information regarding institution and program quality (e.g. self-study). These tools will also provide evidence for institutions and programs to demonstrate alignment with the new General Standards of Accreditation for Institutions with Residency Programs and General Standards of Accreditation for Residency Programs. What work has been undertaken to date associated with the development of the digital accreditation management system (“CanAMS”)? In the fall of 2013, CanRAC began exploring opportunities and new directions in the development of new Canadian conjoint standards and processes for residency education accreditation. Soon thereafter, the development of CanAMS was identified as a key component of residency accreditation reform, and as such, CanRAC partners began analyzing business requirements, which included a short-term contract to provide a detailed analysis of business requirements prior to moving forward with a request for proposal process. In 2016, CanRAC, in collaboration with Association of Faculties of Medicine of Canada, developed a request for proposal (RFP) based upon a common business requirements document (BRD) across the accreditation continuum. Subsequent to vendor demonstrations and comprehensive proposal evaluations conducted conjointly among the four organizations, a preferred vendor was selected. In addition, a detailed phased timeline for the AMS was developed, with phase 1 driven by the timelines identified by CanRAC for the roll-out of the new accreditation process for residency education. Since this time (beginning spring 2017), CanRAC partners have been worked with the CanAMS vendor to develop the first iteration of the AMS (version 1.0) to support testing associated with Prototypes 2 and 3, as well as to prepare for provision of CanAMS to all institutions and residency programs beginning July 2018. While updates to CanAMS have been made since release of version 1.0 to Prototype 3 Universities, it is anticipated that further development will continue to reflect feedback received during internal, external and prototype testing, feedback received from non-prototype 3 institutions and residency programs, as well as planned developments. Will postgraduate offices be required to contribute to the costs associated with CanAMS development? Postgraduate offices will not be expected to contribute to the costs associated with the development of CanAMS (e.g. software development, licensure). It is however acknowledged that there will be an impact on postgraduate offices and their residency programs with respect to the initial adoption of and transition to CanAMS. To increase understanding of the level of impact we will be undertaking a baseline and future workload impact analysis, beginning with testing associated with the implementation prototypes. What support will be provided to assist in the transition to CanERA, including CanAMS? Acknowledging that CanERA is a new system, a robust model of training, tools, and support for all involved in the accreditation process has been developed. The training, tools, and support focus on ensuring an understanding of the changes to the accreditation system based on role in the accreditation process, the ability to navigate and use CanAMS, and familiarization with the new standards of accreditation. Training, tools, and supports available take a variety of forms, and will be rolled-out and based upon role in the accreditation system. For those training, tools, and supports that can be shared digitally (e.g. learning modules, webinar recordings), as they become available, we will post these to the Training, Tools, and Supports section of this website. In addition, specific to residency programs and institutions, while the intent of CanAMS is to decrease the administrative burden associated with preparing for accreditation reviews, refocusing these efforts to higher value activities, it is acknowledged that in the short term, there will be a need for the initial upload of documentation/information to the institution/program profile. To assist with this, CanRAC will be uploading all basic profile information available (e.g. name of programs, last accreditation date, decision, name of program director and program administrator(s), IIA information, previous areas for improvement identified, etc. ); however, the postgraduate office and residency programs will be responsible for the initial uploading and ongoing maintenance/updating of all other information/documentation required in the AMS institution and program profiles. This being said, CanAMS design is intended to be user-friendly, and particular attention is being focused on balancing the need for information to evaluate alignment with accreditation requirements with the need to ensure collection and ongoing maintenance of this information is not overly burdensome. To this end, CanRAC will be evaluating these aspects of CanAMS, including collection of user feedback. CanRAC will also provide access to ongoing technical support to assist with enquiries that may arise. Will I be asked questions specific to my residency program’s transition to Competence by Design (CBD) as part of my upcoming accreditation activity? Based on current practice, residency programs should expect questions that relate to both general and discipline-specific standards in place at least 12 months in advance of an accreditation review. As such, if your residency program transitioned to CBD at least 12 months in advance of your accreditation review, you can expect that you will be held to the expectations outlined in the discipline-specific standards for your discipline based on CBD. If your residency program has transitioned to CBD, but only within the last 12 months, you can expect that you will be asked about how the transition is going, but will not be expected to demonstrate full compliance with the new CBD standards. This is consistent with current practice with respect to changes to discipline-specific standards, as well as the principle that, during this time of transition, perfection on day 1 is not the expectation. What needs to be detailed within the curriculum plan for my residency program? Should the curriculum plan be based on the Competence by Design (CBD) discipline expectations? Pre-CBD discipline expectations? Or both? For Royal College residency programs, the Education Design and Delivery section of the CanAMS program profile instrument requires each residency program to upload a detailed curriculum plan. To assist residency programs with the provision of a curriculum plan, the Canadian Residency Accreditation Consortium (CanRAC) developed an interim template and guidance document which is available within the documents tab of the CanAMS program profile. Use of the template is not mandatory; however, it is expected that the curriculum plan uploaded by each residency program captures the information requested in the template provided, at a minimum. To facilitate the transition and reduce the burden on residency programs preparing for accreditation, each residency program is expected to submit one curriculum plan, even if the residency program has both CBD and non-CBD cohorts of residents. Whether the curriculum plan is competency-based (i.e. based on the discipline’s CBD competencies document), or based on the traditional curriculum (i.e. based on the discipline’s objectives of training requirements (OTR) document), is determined by the discipline-specific standards in place 12 months in advance of an accreditation activity. For example, if a program transitioned to CBD more than 12 months in advance of an accreditation review, the curriculum plan is expected to be based on the discipline’s CBD Competencies document. With the goal of supporting the transition, however, there is an exception to the above. As the CBD Competencies document does not typically differ significantly from the discipline’s OTR (for residents in the traditional stream), should a residency program that has transitioned to CBD less than one year before an accreditation review wish to focus their efforts on the development of a competency-based curriculum plan, that will be considered acceptable (though not required). This should be clearly articulated on the documentation submitted, to ensure it is clear for surveyors and the Residency Accreditation Committee. What are the expectations with respect to maintenance (e.g., ongoing review) of a residency program’s rotation-specific goals and objectives for the traditional cohort, particularly for those programs that have recently transitioned, or are soon to transition, to CBD? A key focus of accreditation reviews for residency programs that have transitioned to CBD, and particularly those with both CBD and traditional cohorts of residents, will be to ensure that no cohort of residents is being disadvantaged through the transition of the residency program to CBD. As such, in the CanAMS, residency programs will be asked to show the sequence of educational experiences/rotations, by year/stage, for CBD/traditional cohorts (and both, if applicable). In this section, residency programs are also asked to specify the purpose/goal(s) of each educational experience, and how the purpose/goals(s) are assessed. Although the new general standards of accreditation no longer require formal rotation-specific goals and objectives documents, for traditional cohorts, it may be easiest to demonstrate the purpose/goal(s) of each rotation by uploading the existing rotation-specific goals and objectives. With respect to ongoing review, there is no longer an expectation to review such goals and objectives every two years; however, this does not suggest that residency programs need not review the rotation-specific objectives to ensure they are appropriate. It will remain important for the residency program to demonstrate that residents and faculty know the purpose/goal(s) associated with each rotation (i.e., there is clarity with respect to what needs to be learnt, taught, and assessed during each) and that the Residency Program Committee has ensured each rotation, including its associated purpose/goal(s), remains appropriate. The new standards allow for flexibility in the review of such experiences/rotations, with increased focus on the outcome (i.e. that the process of review, including its frequency, is sufficient to ensure educational experiences/rotations meet the educational needs of residents in the program). In addition, in the spirit of wishing to ensure that traditional cohort residents are not disadvantaged through the implementation of CBD, while there are some aspects of CBD that can be leveraged for the benefit of traditional cohorts, it is important to note that the training the traditional cohort must still align with the training as identified in the applicable sequence of training requirements document (STR), including sequence and length of training. How will the CanAMS profile instrument differ for those programs with CBD cohorts? The expectation that some of the information included in the education program section of the CanAMS program profile instrument be specific to the CBD. Do note, however, that in answering questions with the CanAMS program profile instrument, unless otherwise specified, it is expected that both CBD and non-CBD resident cohorts are considered/reflected in the response provided. To what extent can I apply CBD expectations for the discipline, to non-CBD cohorts within the discipline? It is at the discretion of residency programs, in collaboration with their postgraduate office, with respect to whether any innovations or practices (e.g., assessment methods, teaching methods) introduced to a residency program as part of CBD, could be leveraged for the benefit of residents finishing their residency program in a traditional cohort. It is nevertheless important to note traditional cohorts must still follow the applicable specialty training requirements (STR) document for the specialty (i.e., residents must still have all rotations/blocks of training required by the specific standards). This requirement will be reviewed by surveyors, accreditation committee members, and specialty committee members as part of the accreditation review process.